Last month, if you recall, we showed you one example of using upper back training to residual effect peak your bench press. This was just one of many residual effect programs we have for the bench press. This month I will show you a different peaking cycle. 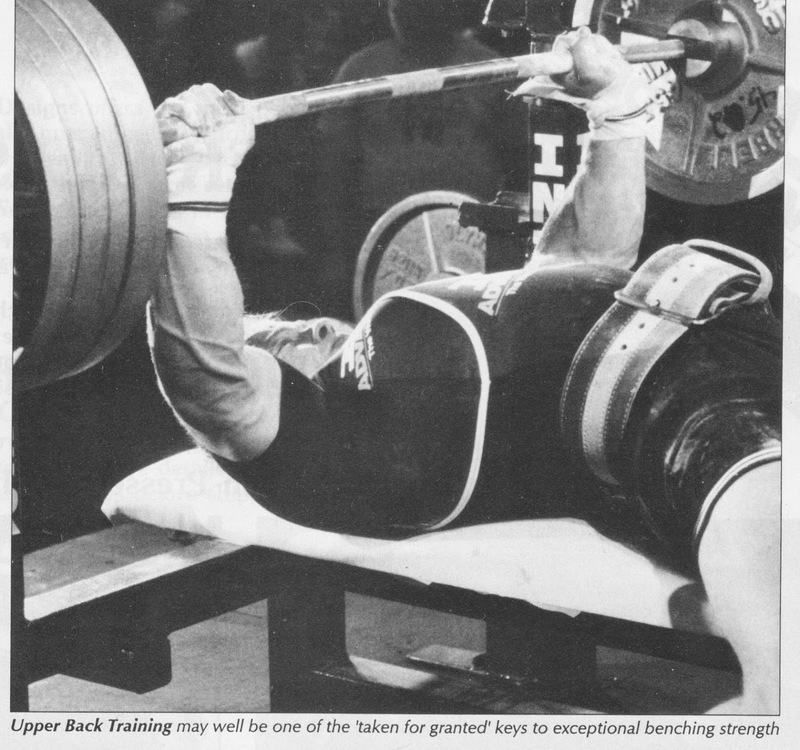 You will use upper back training to peak your bench press through a straight peak. Even though chest, shoulders and triceps are the prime movers for the bench press, your upper back is the fundamental stabilizer that allows you to succeed in a heavy bench press. Many times you will lose your bench press at the bottom when your shoulder blades kick out. Other times you will lose the bench press at the 2-4 inch sticking point because you spread your shoulder blades and rounded your shoulders forward as your elbows kick out. Also, you might have lost your bench press near the top because you were not able to rotate your shoulder blades out properly to push the bar toward the rack and a successful lockout. In all of the cases listed above the muscles of the upper back are not up to the task of stabilizing your bench press drive and without stabilization you have no drive and your bench press gives out. The following program is eight weeks in length and assumes you already have a 330 pound bench press. You may use percentage calculators to convert the numbers for training if your bench press is between 160 and 450 lbs. Outside of those numbers you need a different program. This program assumes you have just finished a period of heavy training on bench press and other chest and shoulder exercises. I assume that you are somewhat tired but not injured or peaked. This eight week program will work you two times per week to push your bench press from 330 lbs to over the 360 mark. Remember, for this workout to be effective, you must have completed at least six weeks of regular and heavy bench pressing with chest, shoulder, and triceps accessory work. This routine will rest the prime movers as it exercises upper back stabilization to peak your bench press with a 5-10% gain. 1) Parallel Grip Pulldowns, 3 sets of 8, moderate weight. Use a straight bar about 3 feet in length with opposing grips. Tilt your head back and look at the overhead pulley as you lean back about 15 degrees and pull the bar to your upper chest. Pinch your shoulder blades together as you pull the bar down. Stretch completely at the top. Note: this exercise should always be light and smooth. 2) Bench Press, follow chart below. Week 1: 135x8, 165x6, 185x1, 225x1, 235x2, 235x2, 235x2, 205x5, 205x5, 175x12. Week 2: 135x8, 165x6, 185x1, 205x1, 225x1, 245x2, 235x3, 225x5, 215x7, 185x12. Week 3: 135x8, 165x6, 185x1, 225x1, 245x1, 275x2, 275x2, 275x2, 245x5, 225x8, 185x12. Week 4: 135x8, 165x6, 185x1, 205x1, 225x1, 255x1, 285x2, 275x3, 265x4, 225x8, 185x12. Week 5: 135x8, 165x6, 185x1, 225x1, 255x1, 285x2, 285x2, 285x2, 225x8, 185x12. Week 6: 135x8, 165x6, 185x1, 205x1, 245x1, 275x1, 305x2, 285x3, 265x5, 225x8, 185x12. Week 7: 135x8, 165x6, 185x1, 225x1, 255x1, 285x1, 315x2 315x2, 225x8, 185x12. 3) Barbell Front Raise, 4 x 7 (this exercise should be light on weeks 5 and 56. Light and drop to 2 sets on week 7, drop totally the week of the meet). Use a barbell held at the level of your sternum with your elbows out and the bar 6-8 inches in front of your torso. Keep he bar 6 inches in front of you as you raise it to the height of your eyes. Your forearms should be nearly parallel to the floor at all times. Your shoulder blades should be pinched back and kept down with your neck long throughout the movement. Lower the bar slowly. 4) Bent Arm Barbell Pullovers, 4 x 8 (this exercise should be light weeks 5,6,7, and drop totally the week of the meet). Use a 6-8 inch grip on a straight bar starting on your chest as you lay on a flat bench with your head slightly over the bench. Keep your elbows bent as you skim the bar over your face and down past your head. The bar should be very close to you at all times. Breathe deeply as you stretch and then pull the bar along the same path to your chest again. 5) Seated Bent Forward Real Lateral Raises, 4 x 12 (drop these on weeks 6,7,8.). Hesitate at the top and lower full extension every rep.
Week 1: 135x8, 165x6, 185x3, 205x3, 205x3, 205x3, 205x3. Week 2: 135x8, 165x6, 185x3, 185x3, 185x3, 185x3, 185x3, 185x3, 135x20. Week 3: 135x8, 165x6, 185x3, 205x3, 205x3, 205x3, 205x3. Week 4: 135x8, 165x6, 185x3, 185x3, 185x3, 185x3, 185x3, 185x3, 135x20. Week 5: 135x8, 165x6, 185x3, 205x3, 205x3, 205x3, 205x3. Week 6: 135x8, 165x6, 185x3, 185x3, 185x3, 185x3, 185x3, 185x3, 135x20. Week 7: 135x8, 165x6, 185x3, 205x3, 205x3, 205x3, 205x3. 2) Standing High Pulley Row to Mid-Chest, 3 x 10 (drop these on week 7). Face the pulley and hold a straight bar with approximate competition bench press grip at the level of the top of your head. Keep your torso straight, back flat, shoulders back, while you pull the bar in a rowing motion to your mid-chest. Your forearms will be parallel to the floor at all times. Shoulder blades should be held down at all times. Release slowly to full extension. 3) Wide Grip Upright Rows, 3 x 12 (keep this exercise light and drop on week 8) Stand gripping a straight bar with a grip slightly wider than your competition bench while keeping your wrists cocked back at all times. You must stand with your knees bent slightly, back flat, head up, shoulders held back and down at all times. The bottom of the movement will be full extension with your wrists cocked at all times. Raise the bar by puffing your elbows out to the sides and up. Forearms will be nearly vertical. The bar will travel about as high as your lower pecs and then slowly lower to full extension. 4) Vertical Cable Crossover, 3x10 (keep light and drop to one set on week 7. Drop entirely week 8). Stand erect in the center of the cable crossover with back flat and shoulders back. Handles will start at the height of your ears. Raise your rib cage and pinch your shoulder blades together as you pull the handles down in an arc to your hips at the sides. Keep elbows slightly bent at all times. Release and raise the handles with slow control. These accessory exercises should always be light enough to maintain good form. You should always work smoothly and with control as you focus your attention on your upper back. The accessory exercises will diminish your peak bench capacity while you are training this peaking cycle. However, as you lighten up and drop exercises the last couple of weeks you will recover and be able to handle much heavier weights in good form. This way you will bench heavier in the contest. Good Luck and Good Lifting!